December is the darkest month here in the northern hemisphere, a time of going within to access the dark maternal matrix of creation. On liturgical calendars throughout Italy, December 10 is the date dedicated to the Black Madonna of Loreto. The sanctuary of Loreto in Ancona, Le Marche, is a major pilgrimage site of Europe with millions of visitors a year. Considered to be the protector of Italy, the Madonna of Loreto is a highly revered and well-known. Sibyls and prophets adorn the outside of the marble enclosure of the Santa Casa, or Holy House, in which her image is venerated. As one enters the small shrine within the large church, there is a feeling of intimacy and accumulated devotion. The Madonna of Loreto is crowned, a clear acknowledgement of the Black Madonna’s power by the church. Thirteen of her titles refer to her as queen, including Queen of Peace. Her statue is carved of red fir and clothed in a single white gown that enfolds mother and child as one. Replicas of the Madonna of Loreto, which are numerous and worldwide, are often distinguishable by this triangular type of dress, adorned with dark crescents and a red triangle over her womb, further suggestions of female power. Miracles of healing, conception, and protection are attributed to her, as with other Black Madonnas. Recipients of her help may send gifts of gratitude or testimonies of grace received to acknowledge an answered request. 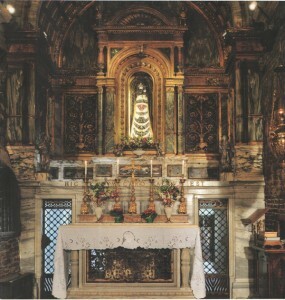 The long list of visitors across the centuries to the Sanctuary of the Black Madonna of Loreto in Ancona includes Neil Armstrong, who visited the Madonna, considered the protector of aviators, in 1969 before the first flight to the moon. After the mission, he returned to place a stone from the moon’s surface at her feet in gratitude. A recent issue of the periodical published at the Loreto Sanctuary features Pope Francis on the cover, head bowed with devotion, as his hand touches a replica of her statue. Although he is blessing her, the raised statue of the Madonna above him creates the appearance of a mutual blessing. In my ancestral homeland of Trentino, Italy, I was pleased to find a carved image of the Madonna of Loreto in a church in the village of Palù di Giovo. In the town of Rovereto, she is venerated as the Madonna of the Snows, who miraculously made it snow in August to halt the advance of Napoleon. In nearby Sondrio, Lombardy, there is a reproduction of the Holy House and of the Madonna of Loreto, venerated as the Madonna of Tresivio, inside a large beautiful church on a hill. December is a month of sacred celebrations of darkness and light: the conception of the Virgin Mary in the darkness of her mother Anne’s womb on December 8; Our Lady of Guadalupe, “La Morena” — protector of the Americas — on December 12; Santa Lucia, visionary and light-bringer, on December 13; the return of the sun after the longest night of the Winter Solstice; and the birth of the Son of Virgin Mary on December 25. In this season of miracles and possibilities, of light renewed and life reborn, may the Queen of Peace in her dark radiance light the way. Darkness preceded Light, and She is Mother.” Altar inscription in cathedral in Salerno, Italy. This entry was posted in Black Madonna, Italy by Mary Beth Moser. Bookmark the permalink.